Manali is one of the most beautiful travel destinations in Himachal Pradesh and is a hill station that is nestled in the northern end of Kullu Valley. With an altitude of2050 meters, Manali is a perfect summer destination in North India due to the pleasant climatic conditions that prevails throughout the year. The scenic beauty of Manali is something unique that can provide a enthralling experience and during the winter seasons, the place becomes more beautiful and charming for the eyes. The popularity of Manali as a hill station destination attracts a large number of travellers from different countries throughout the year. The scenic mountains that surrounds Manali is a major factor behind attracting tourists throughout the year and this hill station in Himachal Pradesh is considered to be one of the best honeymoon travel destinations in India and you can see a lot of young couples coming here to enjoy an amazing honeymoon travel experience. The geographical features of Manali make it a perfect adventure destinations for activities such as Para gliding, rock climbing, trekking etc and a lot of adventure activists even from foreign countries come here for various adventure activities. There are also a number of hippie villages around Manali town where you can spend your time by hanging around. Sightseeing is one of the major activity that one can get involved in Manali and there are a lot of places and tourist attractions worth watching. The Gelukpa Cultural Society Gompa, Museum of Himachal Culture & Folk Art, Nature Park, Nature Reserve, Himalayan Nyinmapa Buddhist Temple etc are some of the major attractions of Manali. These attractions are pretty enough to give you a taste of the rich, unique and ancient heritage of Manali and its surrounding places. 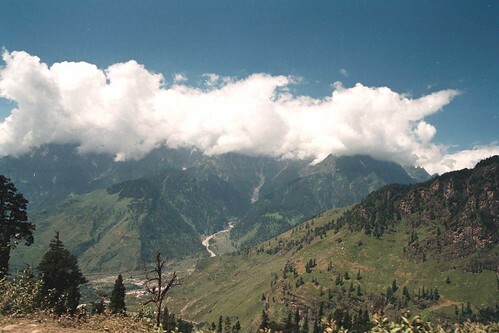 The Rohtang Pass is one of the highest spots in Manali and is considered to be a perfect adventure destination. The Rohtang Pass is also known for its amazing natural beauty and is a highly recommended travel spot in Manali. There are also many other tourist attractions and places in Manali which realyl boosts the overall tourism industry at this place and some of the major travel spots include Hidimba Temple, Kalath Hot Water Springs, Vashist Hot Water Springs, Jogini Falls, Solang Valley, Buddhist monasteries, Old Manali, Nehru Kun etc. For those interested in shopping, Manali offers an amazing shopping experience for travellers and you can buy key chains, name plates, name written single rice grains, sweaters, pull overs, blankets, traditional jewelleries etc. If you are in Manali, do not miss out to have the taste of the local foods at the various marvelous restaurants and hotels in Manali. There are a lot of hotels and restaurants in Manali which will help you in getting a taste of the delicious recipes and cuisines of Manali. Also do get a taste of the local alcoholic beverages such as Lugdi (plains) and Sharab (plains) which are worth having. The nearest airport to Manali is at Bhuntar town, which is about 50 km away and the nearest broad gauge rail heads are at Chandigarh which is 275 km away. But since Manali is connected to the other major north Indian cities by road, it will be very much easier for the travellers to get in and out of this beautiful hill station in Himachal Pradesh. There are a lot of budget hotels and resorts in Manali which will make it easier to get a decent accommodation at affordable rates. Before visiting Manali, you can plan in advance about your trip and accommodation plans and you can take the help from a number of experienced and qualified tour operators who can really make your trip a well-planned and memorable one. Interested in a Planning a Trip to Manali? Just fill the form below and get the best deal from the major tour operators in India. Hurry, as the tour booking for Manali has already started for this season. This entry was posted in Manali and tagged honeymoon destination north india, honeymoon in manali, manali, manali honeymoon trip, manali travel, travel attractions manali. Bookmark the permalink. Manali sounds like an extraordinary destination for nature and adventure lovers as well as those seeking a quiet retreat from the world. The opportunities to trek or participate in other adventure oriented activities are beautifully balanced with arts and cultural venues. You are absolutely right Mary and also thanks for your honest comment! !